Was driving home tonight and we are pretty sure we saw a white Wolf. 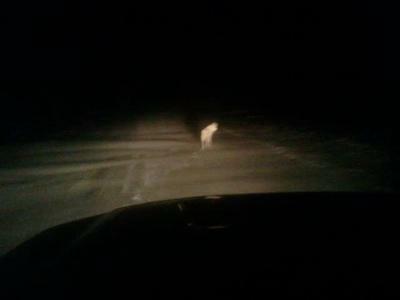 We were on a country road and spotted a white animal In the middle of the road (near Prescott, Ontario). We stopped and it stayed right in front of us. At first we thought it might be a dog, but the more we looked and it looked at us, we're pretty sure it was a Wolf. It then walked into the field. But it must have stays in front of us for a good minute! Are there white Wolves on Ontario? Eastern Ontario to be specific? I did get a picture, but it's a bit blurry. Oh yes, there are Wolves in Eastern Ontario, and I'm pretty sure you saw one of them! They can range in colour from black, through brown and beige, to white. Thank you so much for writing to tell us about your Wolf encounter!